Manda Rin was one-third of one of my favorite bands, bis — perhaps most known in the US for doing the theme song to The Powerpuff Girls , though they did have 3 very successful full-length albums (the first two on the Beastie Boys’ label – who covered one of their songs as a bonus track on The New Transistor Heroes ), along with a lot of EPs. Bis called it quits on Valentine’s Day 2003 (giving music nerds yet another reason to hate that day! ), but all the members have continued to make music; Manda went on to form The Kitchen, who put out a few singles and one excellent album , then she rejoined with the rest of bis as a new band, Data Panik. 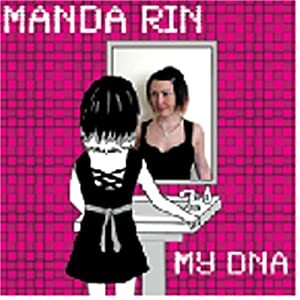 After a couple singles, Data Panik disbanded, and now Manda’s released her first solo record, the amazing My DNA , released on This Is Fake D.I.Y. in the UK and Retard Disco in the US. When not doing music, she’s also the owner of Wee Badgers, a badge-making company. I’ve loved bis since I first heard them on the debut episode of the Powerpuff Girls, and bought their This Is Teen-C Power! EP about a week later… and I continued to buy the rest of the stuff as quickly as it could come out — so I was really excited to do this interview! Manda Rin: Late of the Pier – The Bears Are Coming. Manda Rin: Late of the Pier. Absolutely stunning! I thought everyone did know about them but a lot haven’t surprisingly. What, if anything, is on any particular wall (your choice) in your domicile? Manda Rin: A canvas of Tokyo from a photo I’d taken. Manda Rin: Selling 100,000 albums in Japan! Who’s your favorite visual artist (excluding yourself)? What are the five most recent films you’ve seen? Manda Rin: I don’t get time to watch films much sadly. Valvari is the only one I can say at the mo that I saw while on holiday in San Francisco in Jan.
Manda Rin: Grease , The Shawshank Redemption , Life Is Beautiful . Do you own any original artwork, and if so, whose? Manda Rin: I don’t. I have a few canvases of photos I’ve taken that a company makes me (LucyArt). They look fantastic, I have to say! Manda Rin: Scrabble, Tony Hawk’s Pro Skater . What sort of pie do you enjoy? Manda Rin: Apple. Hot, with ice cream. If you could say one thing to David Byrne, what would it be? Manda Rin: My boyfriend thinks you’re amazing but I’m not really a fan. See you next month in Glasgow though! Actually, no, I wouldn’t have the courage to be negative to him to be honest! What is the most boring thing you’ve ever experienced? Manda Rin: Mamma Mia! the movie. What a joke! Saw it on a flight. At least it kinda passed the time, but maybe I’d rather have stared at the food tray in front of me. Manda Rin: Molly. It’s such a cute name. Manda Rin: Oooh, spicy stuff. Chicken tikka probably. Manda Rin: Anything not on a computer. You’ve always done the artwork for your records — if you weren’t a musician, do you think you’d have been a designer? Manda Rin: I love doing artwork. I enjoy that the most about my badge job. I’ve been asked to do drawings for an iPhone game and I’ve done stuff for magazines in the past, so it’s very flattering and enjoyable to get these kinda things. How did you get into the badge-making world? Manda Rin: Years ago I bought a little machine to make bis ones. Then more and more people asked me to make them some. Then, I ended up with machine after machine as I had to get staff. I then left the radio station I worked at as it was getting so crazy but nicely earning me more than there. Great progress I thought, and I love working for myself as I can still do my music etc around it as my laptop comes everywhere. It’s sad not getting a real holiday or day off ever, but I do love my business so shouldn’t complain. Do you think Wee Badgers will expand into other types of items, like t-shirts? Manda Rin: I’m not sure. Nothing like t-shirts I doubt, but maybe stickers or keyrings. Did you make the Manda Rin finger puppet in the My DNA liner notes and the DNA 7″ sleeve? Manda Rin: James who plays guitar for me live found it on a little stall in Spain while at the Benicassim festival. Freakily I sent him a text at the moment he saw it so had to buy it! Sci-Fi Steven produced My DNA — did you perform all the instruments on it? Manda Rin: Most stuff, especially synths and programming. But you can probably hear the stuff that’s not so well played (some dodgy guitar riffs). I played most stuff, but got the live bass and good/most guitar bits played by Steven as I know I can’t play them good enough. The great thing with bis is that each album was completely different from the one previous; was that an intentional move, or did it work that way? Manda Rin: It’s just the way it turned out. From age 16-26 you change a lot with your influences and skills, so it was just natural. I like hearing what album is people’s favourite as it’s always for a different reason. It reminds me of Blur as their albums are like that too and everyone has their own fave (bis ones are nowhere near as good though!). The song “Cubis (I Love You)” from the first Data Panik single also appeared in a completely different version on the recent bis best-of ; was “Cubis” originally a bis song? Manda Rin: It was the last workings of bis, but we liked it so much that we nicked it haha. If bis had continued, what do you think the fourth record would have sounded like, given that the first was more disco-punk, the second more euro-pop, and the third more electronica/chill? Manda Rin: I think we’d have gone back the way to more electro pop, but not entirely sure. It was what we did best I think, and what we look back at quite fondly. Return to Central is the best overall album I’d say as it’s quite dark and emotional. That job is done though so I wouldn’t do another like that. How much Data Panik stuff was recorded versus what was released? Will those recordings ever come out, too? Manda Rin: We recorded so much stuff yet it never got a release. Who knows if it ever will now sadly. Do you know if your Nevermind The Buzzcocks appearance will ever be aired? Manda Rin: I was told it might at the end of the year with all the reruns. Very sad indeed. What do you think about the recent scandal over Jonathan Ross and Russell Brand calling Andrew Sachs and making rude references to his granddaughter for a bit on the radio? What do you feel about the canceling of an institution like Top Of The Pops? Manda Rin: Very silly! Everyone loves TOTP! What’s it like being on a label named after one of your own songs? How did doing the Powerpuff Girls theme song come about? Manda Rin: Craig McCracken was a fan and asked us to do it after seeing a few pilot episodes. What a great thing to get asked to do, and I’m so proud of that claim to fame! How did bis get tapped to do the songs for BB3B? Manda Rin: The BBC just got in touch as they liked bis songs we’d done in the past. Again, a great thing to get asked to do. I’m waiting for more crazy offers like these! Do you think you’ll be able to tour the states? Manda Rin: I’d love to but I don’t think I could afford it now that I need a day job for my mortgage etc. I also don’t have a label with money to get me and my band over there with visas, so who knows. Maybe just one-off cool things, but anything would be good to be honest, as I’d love to do it! What do you think would be the most surprising thing in your record collection? Manda Rin: A personalized record called ‘Amanda’ I got for my birthday. Where did the name “bis” come from (assuming the “Starbright Boy” video isn’t based on a true story!)? Manda Rin: Before I joined, John and Steven were ‘black iron skyline’, a line from a The The song. This was the amazing abbreviation that led us to making up lots of stories for fun. Now I’ve spoiled it! Of the fake stories about the origin of the name “bis”, do you have a favorite? Manda Rin: Big in Scotland. I’ve read before that you were fan of the whole Riot Grrrrl movement, and I’d imagine some of the music that came after that initial wave. How has that influenced your musical career, in particular with regards to the work of Kathleen Hanna? Manda Rin: I probably wouldn’t have had the courage to do music at all or get on stage if it wasn’t for such amazing people like Kathleen Hanna, Huggy Bear, Corin Tucker etc. This was one of the most important movements in my life and I’ll never forget these people for changing my life and giving me courage and determination. Have you ever heard the Japanese band named “BIS“? Manda Rin: Yeah, I want to sue! Manda Rin: Oooh tough one. So many actually. Kathleen Hanna or Björk would be the most interesting. Have you ever been interested in producing someone else’s record? Manda Rin: I think I’d find that quite scary being responsible for someone else’s work, but it would be a good challenge actually. Do you have any other projects you’re working on you’d like to mention? Manda Rin: Just the iPhone game at the moment really, but I’m still waiting on more details.